Artwork of Muskular from Mario Party 5. Muskular is one of the seven Star Spirits. As his name implies, Muskular is a very strong Star Spirit who likes to work out, first appearing in the original Paper Mario as the fourth Star Spirit to rescue from Bowser. He likes to wear a sailor's hat, meaning he could like the water or just chooses to wear the hat, and is always full of energy. He is guarded by General Guy and his troops in the Shy Guy's Toy Box in Chapter 4: Trials in the Toy Box. When Mario defeats General Guy, Muskular gives him the ability to use the Chill Out move. When Chill Out is used, Muskular appears and decreases the enemies' attack power by three. The move costs two Star Power. 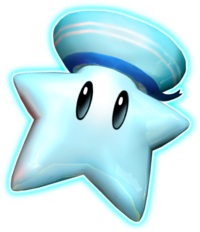 He later appears along with the rest of the Star Spirits in Star Haven when they give Mario the Star Beam. In Mario Party 5, Muskular, along with all the other Star Spirits, returns. Here, he is the guide of the minigame mode. Muskular appears as a sticker in Super Smash Bros. Brawl. It raises launch resistance by 13, and it can be used by any character. Nīru From ani, older brother. This page was last edited on November 8, 2018, at 17:46.